Primary immunodeficiencies (PID) are a heterogeneous group of disorders that disturb the host’s immunity, creating susceptibility to infections. PIDs are genetically diverse, with mutations in many different genes capable of causing immunodeficiency. The clinical symptoms of PIDs include, but are not limited to, susceptibility to infections, inflammation, and autoimmunity, although each gene mutated, and indeed each individual mutation, can lead to different manifestations. Central to understanding PIDs is to understand which immune cell type is rendered defective by the mutation the patient carries. The type of infections the patient develops is often a key indicator of the underlying immunodeficiency; for example, pulmonary infections and bacterial septicemia are associated with B cell defect, whereas fungal susceptibility is associated with defects in certain types of T cells. Candidate pathways can be investigated using genetics and immune screening, and successful identification of the underlying causes allows a treatment program to be tailored to the patient. Roifman syndrome is a rare autosomal recessive PID. It was originally believed to be an X-linked syndrome since the first six patients to be described were male. It was recently discovered, however, that the disease is not X-linked and is caused by mutations in the small nuclear RNA noncoding gene RNU4ATAC. To date, only ten cases from seven families have been reported with Roifman syndrome, although unreporting is expected, with most clinicians unaware of the disease. Roifman patients present with growth retardation, cognitive delay, retinal dystrophy, and spondyloepyphyseal dysplasia. Roifman patients are also immunodeficient, only presenting with recurrent respiratory infections, otitides, and a diminished vaccine response. In a recent study, we sought to understand the nature of the immunodeficiency suffered by Roifman patients, to allow better treatment of this devastating syndrome. In a study led by Prof Adrian Liston from the VIB in Belgium, Roifman syndrome patients were extensively studied at the immunological and molecular level. 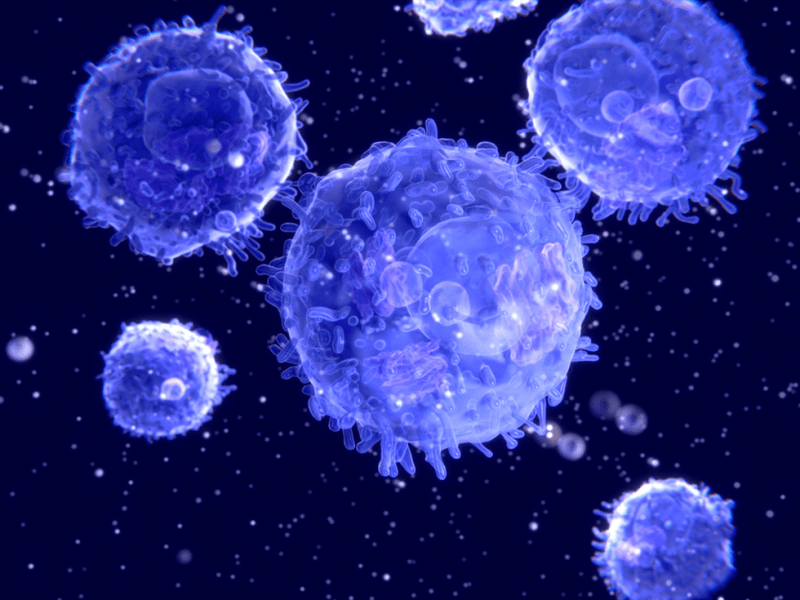 By investigating the immune system of the Roifman patients, the authors found that patients exhibited a major problem in the white blood cell type known as B cells. Dr. Josselyn Garcia-Perez likens the defect to the B cells being trapped in childhood. “B cells are born in the bone marrow and migrate into the blood. These ‘transitional’ B cells, fresh out of the bone-marrow are like children and still need to mature before they can do the full workload of adult B cells. In Roifman patients, their B cells get stuck at this transitional stage, and the patients never get a normal set of B cells.” In the absence of mature B cells, the patients are unable to make antibodies in response to infections, leading to prolonged infections and frequent reinfection. The authors further investigated this defect in B cells at the molecular level. The patients bore mutations in the gene RNU4ATAC, which is an essential part of the RNA splicing complex. RNA is often described as the messenger that links the instructions encoded in DNA to the protein building blocks that make up the cell. RNA is generated by copying small lengths of stable, and largely inert, DNA into the dynamic and unstable RNA molecule. This RNA is then able to leave the nucleus of the cell and travel to molecular factories called ribosomes that read the instructions encoded in RNA to make proteins. This process is known as splicing and involves piecing together the key code of the gene (or “exons”) into a single long strip of sequence. There are two sets of machinery that can splice RNA in the cell – the major splicing complex and the minor splicing complex. The major splicing complex is so essential to the cell that defects in this process are lethal at the single cell stage and never observed in patients. The minor splicing complex is less important, as only a handful of genes use it to piece together their instructions. The RNU4ATAC gene that is mutated in Roifman patients is part of this minor splicing complex, with the symptoms of the disease being driven by errors introduced in the genes that need it. Figure 1. Splicing defect in MAPK1. (A) Sashimi plot showing MAPK1 splicing in healthy controls (HC) and Roifman patients (P1 and P2). The “IR” region is edited out successfully in the healthy control but is often left in Roifman patients. (B) The splicing error in MAPK1 results in an extra sequence (orange) being left inside the correct (blue) RNA sequence. This defective RNA molecule fails to produce the protein MAPK1. Image published with permission from Elsevier from https://doi.org/10.1016/j.jaci.2017.11.061. These findings are described in the article entitled Abnormal differentiation of B cells and megakaryocytes in patients with Roifman syndrome, recently published in the Journal of Allergy and Clinical Immunology. This work was conducted by Jessica Heremans, Josselyn E. Garcia-Perez, Ernest Turro, Susan M. Schlenner, Ingele Casteels, Roxanne Collin, Francis de Zegher, Daniel Greene, Stephanie Humblet-Baron, Sylvie Lesage, Patrick Matthys, Christopher J. Penkett, Karen Put, Kathleen Stirrups, on behalf of the National Institute for Health Research BioResource, Chantal Thys, Chris Van Geet, Erika Van Nieuwenhove, Carine Wouters, Isabelle Meyts, Kathleen Freson, and Adrian Liston. Adrian Liston is a Belgian immunologist and professor at the KU Leuven (Leuven, Belgium). He is head of the VIB Translational Immunology Laboratory. His main research interests are in the fields of autoimmunity, primary immune deficiencies and diabetes. Liston led the discovery of Pyrin-associated autoinflammation with neutrophilic dermatosis, a previously unknown auto-inflammatory disease caused by mutation in the gene MEFV. Liston is also known for identifying genetic fragility of pancreatic beta cells as a cause of diabetes. In 2016, Liston led a team that found that cohabitation modified the immune system, making partners more similar to each other. His research team has emphasized the role of the environment over genes in shaping the immune system. In 2017, his team identified novel mutations in the gene STAT2 which lead to primary immunodeficiency. I am a Biologist by training and I have a Ph.D. in Biomedical Sciences. As a Postdoctoral fellow, I am currently working on pediatric immunodeficiencies and translational immunology. Currently, we are working on a comprehensive mass cytometry (CyTOF) panel to identify the key compartments of the immune system to help us understand such complex diseases. Previous Post« Previous Is Parenthood Related To More Socially Conservative Attitudes?